ABOUT RUBBER PLANT: Aka Ficus elastica, this gorgeous floor plant acts as leafy and colorful focal point in a room. Decorators love them because of their big, shiny, burgundy-hued leaves. YOUR UNIQUE PLANT: Plants are living things; each one is slightly different, so the plant you receive may vary from the photo. It typically measures 26 to 28 inches tall from the pot bottom to the top of the plant. NOTE: This season we have limited quantities of Rubber Plants so the minimum shipping height is 24 inches tall. Our growers hand pick the healthiest, best-looking, highest-quality plants. We package our plants for shipment with great care so they’ll arrive at your home ready to be displayed. We're unable to ship this item to: AK,AZ,CA,GU,HI. PASSIONATE ABOUT PLANTS: Our plants come in pots for all decorating needs: shelf size (7-14 in. tall), tabletop (16-24 in. ), and floor (24-48 in.). Look for COSTA FARMS when buying plants online. Be aware of third-party sellers; other companies try to imitate our quality. On Amazon, there are no other authorized Costa Farms sellers. Look for “Ships from and sold by Amazon.com” to ensure you’re getting our premium plants. Shipped fresh from our farm to you, Costa Farms is passionate about delivering happy, healthy, beautiful plants. Send us your feedback at questions@costafarms.com. EASY CARE! Water the top inch of soil of the Rubber Plant once the soil feels dry. Never allow the soil to become saturated. LOVES INDOOR LIGHT: Rubber plant happily grows in bright light. Light helps their leaves retain their burgundy color. BONUS! A MODERN DECORATOR PLANTER: Rubber Plant comes planted in a 10-inch gray decorative pot, ready to adorn any room. These lush plants are grown by the horticultural experts at Costa Farms. REAP HEALTH BENEFITS: Studies show that raising plants such as Rubber Plant help clear indoor air of pollutants. Having plants in your home improves your mood, sparks your creativity, and reduces stress. 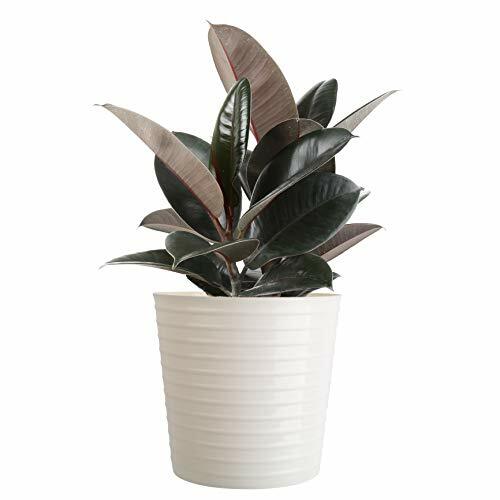 ENJOY LIVING HOME DÉCOR: Rubber Plants feature exotic dark, striking foliage and add life to your home, porch, or office. Ships at a minimum of 24-in. tall. Keep this plant for yourself or give as a gift!